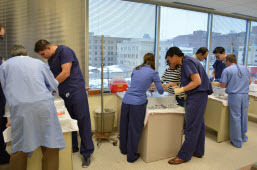 WISER debuted a new surgical simulation course this week. The Preparation for CT Surgery-Cardiac Simulation Lab course is a surgical simulation course targeted towards Cardiothoracic Surgery Residents. This course specializes in Coronary Anastomosis, which focuses on maintaining proper blood supply in vessels to the heart. The residents utilized tissue to practice aortic and venous cannulation in a simulated environment. This course was created by Dr. Chris Cook, who is a board certified physician in Cardiothoracic Vascular Surgery.